Scientists have identified a planet-like object orbiting a white dwarf star—a discovery that provides key information about what will happen when our own sun runs out of fuel and transitions into this type of celestial object. Over recent decades, thousands of planets have been found orbiting stars beyond our solar system. Almost all of these are in systems with main-sequence stars—like our sun—that get their energy from nuclear reactions in their core. Eventually these stars run out of fuel. When this happens, they turn into red giants. Our sun will start this process in around 5 billion years. When it happens, it will expand into the solar system, engulfing Mercury, Venus and probably Earth. Eventually, its core will collapse and it will become a white dwarf—an extremely dense, faint star about the size of a planet. Any remaining planets orbiting a white dwarf move closer to the star and start colliding, smashing them up until they become a cloud of rocky debris. 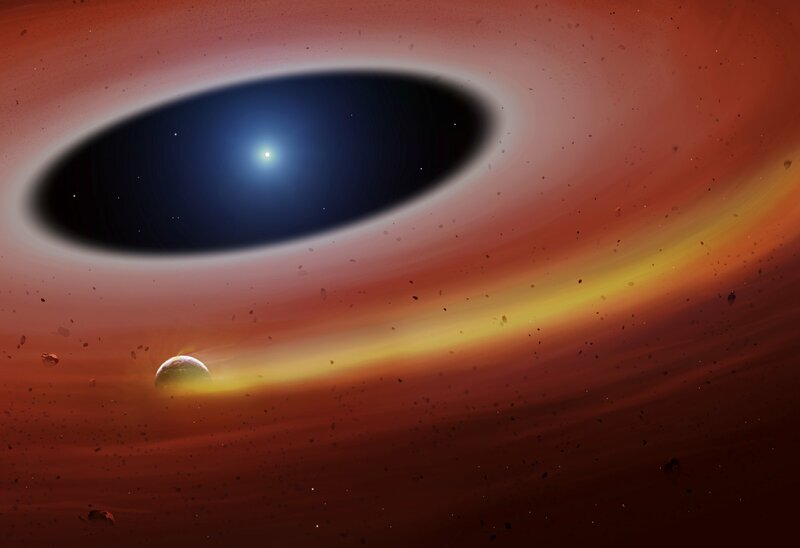 In a study published in Science, Christopher Manser, of the U.K.’s University of Warwick, and colleagues, presented evidence of a small, intact planetary body orbiting the white dwarf SDSS J122859.93+104032.9. To their surprise, the team found a planetesimal—a solid object formed through colliding rocks that clump together. They say the object must be around 370 miles in diameter and extremely dense. If it is not, it would be torn apart by the gravitational forces from the white dwarf. They suggest the planetesimal could be the core of one of the solar system’s planets—the outer layers having been stripped away. The discovery allows scientists to have a glimpse into the future of our own solar system. While the inner three planets will be destroyed, the remainder will survive. “By studying systems like SDSSJ122859.93+104032.9, we can learn more about the future of the solar system, and the majority of all known exoplanetary systems, which orbit stars that will themselves eventually become white dwarfs,” Manser said, adding that they now plan to hunt down more planetesimals orbiting white dwarfs. Jay Farihi, a professor in University College London’s physics and astronomy department, who was not involved in the study, said the planetesimal was similar to a “ring moon”—an object orbiting in the disc of rock and dust surrounding the star, a bit like how objects persist in Saturn’s rings.